After two decades of universal praise for the Ankle Glove®, Galco has added the Ankle Lite holster to the Concealed Carry Lite® family of holsters. Using the same wide neoprene ankle band and Velcro closure as the Ankle Glove with Center Cut Steerhide® for the holster, the Galco Ankle Lite combines extended wearing comfort with unmatched security. Additional comfort is provided by sheepskin padding between the holster and ankle, while speed of draw is enhanced with a reinforced thumb break retention strap. The Ankle Lite may be worn with or without the optional adjustable calf strap (sold separately), and accommodates ankles up to 13" in circumference. The Ankle Lite is made for semiautomatic pistols. Perfect fit Quick and solid. This is my third Galco Ankle Holster. well made and comfortable to wear all day. My 442 is always secure in this holster. Ive had to run and jump fences. Two Stars only because it will basically serve the purpose. But im not a big guy and the securing strap is a little short. in addition it would be nice if they went back to making the leather holster with the ring and Velcro to secure it. Pretty sure I chose the right option for my Smith & Wesson Body Guard .380 and the fit is poor. I am a guy who does not have calf's, more like full grown cows, and this ankle holster just barely has enough material to get the Velcro to attach to it's counter part material to hold. Will need to now get the extender for an additional 40 to get this system to work. Like the lamb skin on the inside, appears like a quality build otherwise. Very comfortable to wear and undetectable. Ruger LCP with laser fit almost too tightly in holster at first but seems to be loosening up a little. Otherwise, I'd give it 5 stars. I'd recommend it. I purchased this for my Springfield XDs. The comfortableness of this holster is superb. My concern was it was going to have a bulky sensation to it, causing me to be conscious of it constantly. Not true. It really is so comfortable you almost forget you are wearing it. OK, any negatives? Yes. I am not a big guy and the wrap around is not as long as it should be. If I am wearing above the ankle footwear (boots), this won't work. Maybe this was intentional because you can buy an extension which I did for an additional cost. 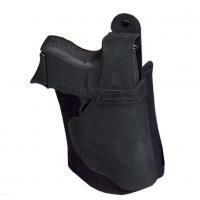 There is also another accessory that might be useful that extends from near the knee and holds the holster. This is a good idea if you can deal with all the extra equipment about your leg. Yes, I got this as well. The 4 stars and not 5 is because of the length of the holster wrap this could have done better. But overall, this was an excellent add to my holster. I did make the mistake of showing and raving about it to my wife. Yeah, yeah, had to buy one for her, too. It's comfortable after 5 min. Don't even know it on like a ring or a watch. I'm happy just hope I don't forget it on and go somewhere I shouldn't. I am a new concealed carry person in Il. I am very concerned about truly being concealed and don't want to carry a snob or 380 other then as back up. This ankle holster for my Glock 27 is awesome in loose fitting pants or sweat pants (my normal daily attire) with 1 in the pipe and 10 in the mag., I feel like I'm covered. Will this holster work for a Kahr PM9 with a Crimson Trace Laser Guard? Unfortunately this holster will not work with the Kahr PM9 with Laserguard. Yes, select 'Ruger LCP with CTC Laserguard' as your fit.